This 4 bedroom luxury villa with private pool will not disappoint. We bought this property for its perfect location to all local beaches Jomtien & Pattaya, also very close by are Supermarkets, restaurants,bars,coffee shops,shopping centres,golf courses near by, and of course the great nightlife Pattaya has to offer. 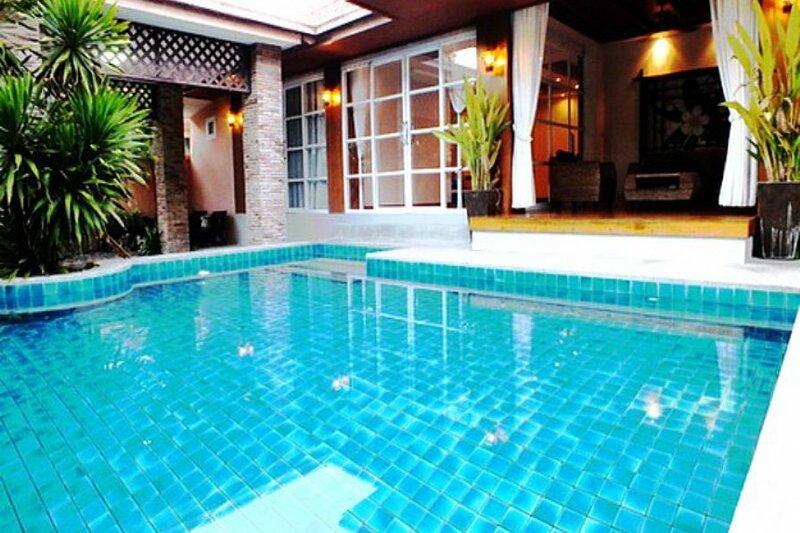 Villa Baan Suay Thai is located in a private village, which has also a large communal pool, we have 24 hr security, the villa is very private and peaceful with high walls for your privacy. The outside area has a excellent private pool a great waterfall feature which lights up at night, there are 3 separate seating areas outside to enjoy and relax. There are ample sun loungers for your use situated around the pool area, outside fans to keep you cool . The surrounding garden is lit by night offering a romantic atmosphere. There are 4 double bedrooms, all have full En-suite bathrooms. The bedrooms are all very comfortable and modern, fully air conditioned,all bedding and towels supplied and changed regularly. The open plan lounge and kitchen will not disappoint it has been designed perfectly for your comfort, there are great leather sofas and chairs in the lounge to relax and enjoy the satellite TV, or there is a DVD player for those movie enthusiasts and all the latest movies can be bought locally very cheaply.Wifi Internet is available please bring your own laptop. The Dinning table has luxury leather seating and can seat up to 6 people. The luxurious open plan Kitchen with breakfast bar and seating for a further 3 people, is what truly makes this villa special!! fully equipped with cooker hob, oven, fan extractor, microwave, fridge/freezer,utensils. No expense has been spared on this villa. The villa is situated in a perfect location and easy access for the local area, with Jomtien local beach only around 10 min walk/stroll away, with Pattaya beach & main entertainment area only 10 away by car. We are only around 5 min drive away from major shopping centres and Supermarkets Tesco/Lotus, many local bars, Thai restaurants,coffee shops,entertainment areas very near by. Jomtien beach is very nice and peaceful and there are many water sports activities. If sightseeing is your thing we can arrange tours and a day out. We can arrange car hire for you at very reasonable prices!